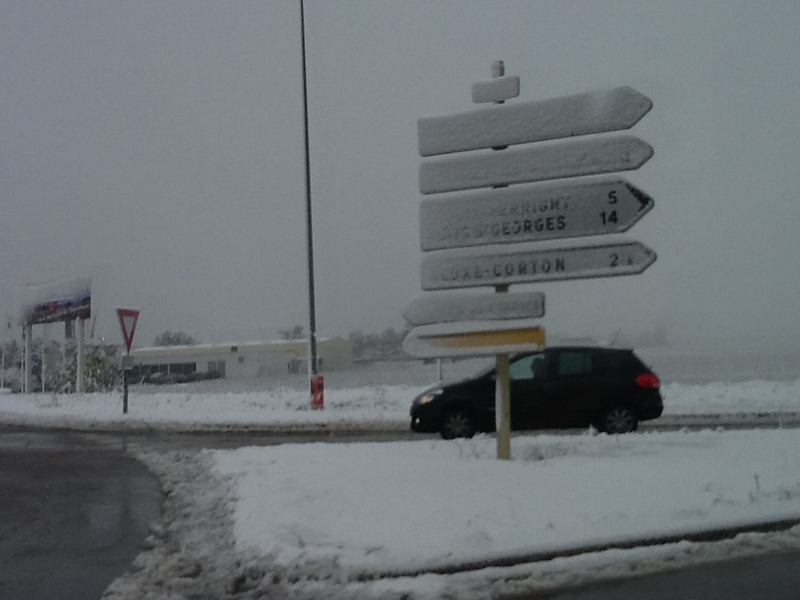 I was reminded of Schumacher when I was in snowy Burgundy recently to taste the 2012 vintage. The British economist wrote a book in 1973 called “Small is Beautiful: A Study of Economics As If People Mattered”. Published during a chilly economic recession in Britain, the idea is that because man is small, ergo, small is beautiful. The central argument based on observing village life is that “bigger is not better”. In mossy caves, tasting from the barrels with pipettes held by the winemaker, there is something human (even humid, it was colder outside in the snow) about tasting in Burgundy cellars. The vintage is small. Again. And it is intensely beautiful. There are large negociants and domaines in Burgundy but at its best, Burgundy is a testament to the small. 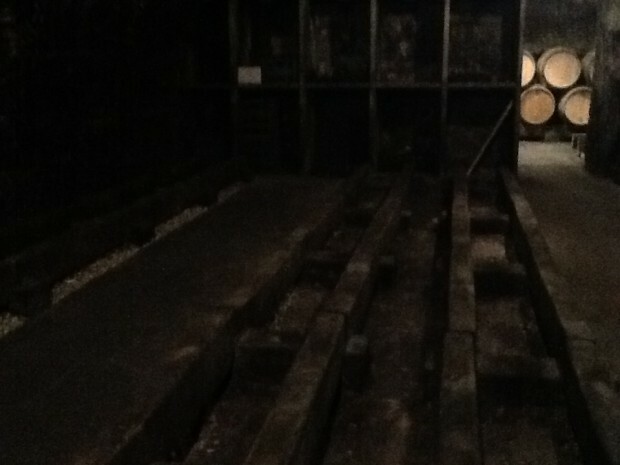 Each year there have been less and less barrels (Grivot, below). I was told by one domaine that the barrels along the wall were filled with water to ensure the expensive oak does not dry and crack. Some were using more oak in their villages level wines rather than have it lying around. The hail storms on June 30th wiped out many rows of vines in Volnay and Puligny (and some southern Nuits-St-Georges). Visiting one small family in Volnay was a white knuckle experience: there is so little wine that every drop was precious and I could feel the nervous stare of the family. According to the “bigger is best” economic theory, this is simply survival of the fittest. However, it is not that the domaine is producing bad wine. To the contrary, the wine is excellent in 2012. There is just not enough wine to cover the costs and the losses. It is now the third year of small yields but how much can they put up the prices in one year? The vineyards are not a revenue stream like a gold mine. The land is the capital. The people are, too. As well as the family and the history of the land. And the technology will only solve this problem up to an extent but the quality ultimately comes from the fruit. The Schumacher-ian way of thinking about the environment as capital is already ingrained into the fabric of Burgundy. The wines from 2012 reminded me of the 2010 vintage but with greater fruit concentration and intensity. Tasting, what I like to call the “poetic” vineyards of Echezeaux and Vosne Romanee, I even thought I saw in the vivid fruit shapes of the fruit. Much like the drawings a child learns from in picture books. A is for Apple. The word used to describe this by winemakers is “aérien”. It is not something that can be directly translated into English. The closest would be lifted or ethereal although some winemakers described it as “flying”. It lifts off the page and into the imagination. In fact, what you want from a great Burgundy experience. The reds and whites have more energy than the 2009 vintage. The 2009, especially the villages whites, are ready to drink now. Stop drinking 2007 if you can and turn to the 2009. They have more bold fruit concentration than the 2011 vintage, which looks more elegant. I believe 2012 will outlast the 2010. But you are more likely to find a bottle of 2010 in the future. Is the chaotic weather, and lack of fruit, in the marginal climate vineyards in Burgundy the canary in the mine? Is it, as Natalie Tollot suggests, what we should expect this region can produce? Or is it just a cycle of weather (and economics) that will return to the “old normal” where the vintages ending in 5 tend to excel. But the “environment” is not just Burgundy, an idea hovering over the area like a cloud between Dijon and Lyon. Much like the recession, there are deep structural problems to any growth in a broken Environment. The solution may lie beyond the powers of imagination. Exactly where wines from Burgundy can take you.